Grapes are loaded with nutritious benefits. It is said that grapes are good for you, but what vitamins do grapes contain and what benefits are derived from adding grapes to your diet? In other words, exactly why are they good for us? Flavonoids: A few recent studies looked at flavonoids and Alzheimer's disease. They determined that flavonoids available in grape and green tea reduce brain pathology. In some instances cognition was improved. Reversatrol: Primarily available in the skin and seed of grapes. It promotes heart health and is an anti-inflammatory. Does Cranberry Juice Have Vitamin C? What is so interesting about these phytonutrients is that for the most part, they are concentrated in the skin, stems and seed of the fruit. Polyphenols have been shown to decreased risk of heart disease through the reduction of platelet clumping and by shielding LDL cholesterol from harm brought about by free radicals. 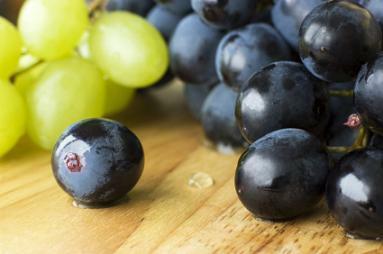 Along with the phytonutrients found in grapes, what vitamins do grapes contain? One cup of grapes contains the following vitamins. If you're looking for a healthy snack that feels like a real treat, wash grapes, remove from the stem and let dry in a strainer. Place dry grapes in a freezer bag or container and freeze. Frozen grapes make a healthy alternative to a frozen treat like ice cream, and they are loaded with all things good for you.